Dekrastone deliver a unique and tailored approach for each individual client. We offer a truly bespoke service from the initial consultation and design to your finished stone work surfaces. Working closely with some of the most respected names in the kitchen industry, Dekrastone have built and enviable reputation for design, craftsmanship and customer care. Constantly striving to improve our technology advancements and service, Dekrastone really are your number one choice for solid stone work surfaces. At Dekrastone we only work with the world's leading brands to ensure the best materials are being used on all our projects and Granite Worktops. We are approved fabricators for the global leading supplier of Silestone® by Cosentino. Not only can we offer you Silestone's unique 25 year warranty, we are also able to offer the most competitive prices. We are also approved fabricators for Cosentino's new large format ultra - compact surface, Dekton. We can therefore offer our clients a certified 10 Year Warranty from Dekton. As approved fabricators of Sensa granite, our customers receive a 15 Year Warranty, the only brand in the world that offer a warranty against their Granite Worktops & Products. Kingston Mosaic & Tiles offers a range of products of exquisite quality at competitive prices pertaining to Tiles and Home Decor. Conveniently located at the intersection of West Street and Wallace Street in Glasgow, our experts provide excellent service and suggestions as needed. Besides in-store service in our Glasgow Showroom, we offer the feasibility of online shopping for Tiles and Lighting as well, so you are able to make a purchase from the comfort of your home. Kingston Mosaic & Tiles provides a variety of intricate designs of Mosaic Tiles and Floor and Wall Tiles. Similarly, Kingston Lighting offers an assortment of Lighting such as Chandeliers, Table Lamps, Suspended Ceiling Lights, Floor Lamps, Wallpapers and other Decorative Accessories for its customers in Glasgow. We are a one stop store committed to providing durable items to design or renovate your kitchen, living room and bathrooms. A variety of elegantly designed Mosaic Tiles are available such as Glass Mosaic Tiles, Stone Mosaic Tiles and Marble Mosaic Tiles to suit your needs. Moreover, a vast range of Floor and Wall Porcelain Tiles and Granite Worktops are available to choose from. Myriad Lighting Styles are also offered to brighten up your home; from luxurious Crystal Floor Lamps to lavish LED Chandeliers. We at Kingston Mosaic & Tiles and Kingston Lighting are here to cater to your aesthetic sense whether contemporary or vintage. Kingston Mosaic & Tiles and Kingston Lighting are family owned businesses that evolved through several years of property development experience. Purchasing a variety of Homes and Flats led to not only a deeper understanding of Home Improvement, but also gave birth to the idea of creating a platform dedicated to assisting Home Owners attain their Home Décor dreams. Wall and floor ceramics and porcelain tile installation. Carpe Diem Terrazzo Ltd is a family run business specializing in Terrazzo flooring, Marble and all aspects of wall and floor tiling. We thrive on bringing back to life old and worn Terrazzo as well as creating new bespoke designs. Our craftsmen are some of the best in the business and have a proven track record of innovative designs, effective problem solving, our attention to detail is second to none and our goal is to meet and exceed the expectations of every customer. We take on all types of jobs from small domestic work to larger commercial projects, all carried out to the highest standards, and at very competitive prices. Marble Direct specialises in kitchen worktops and tiles. Designing and creating custom-made works for architects, interior designers and domestic and commercial projects. We do all aspects of stonework including floors, walls and staircases. As well as kitchen countertops, bathrooms surrounds, vanity tops and fireplaces. Unique designer pieces bring the luxury of natural stone to your home. Simple touches on flooring and around the fireplace by installing natural stone will add elegance and value to your property. 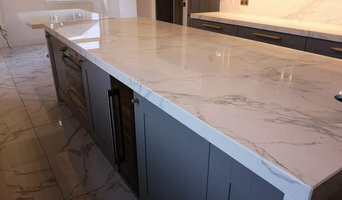 At Marble Direct we take pride in our extensive knowledge of marble, quartz and granite. We have been in the natural stone industry for over 19 years. We have been manufacturing and supplying high-quality granite worktops, marble worktops and Quartz kitchen worktops since 2000. Our large showroom based in Glasgow displays a host of natural marble fireplaces, tiles and granite worktops to meet all your specific needs. At Marble Direct we stock a wide assortment of marble and granite floor and wall tiles. Services > Bathrooms > Kitchens > Wetrooms > External > Conservatories > Commercial Projects We have the experience to carry out all types of tiling from ceramic, mosaic, porcelain, natural stone, marble, limestone and many more. Offer guidance on the best possible tiles to suit your needs. Supply all relevant materials for any projects including tiles, grout, adhesive and various edging trims. Tesoro Tiles offers a huge range of porcelain and ceramic wall and floor tiles for kitchens and bathrooms. 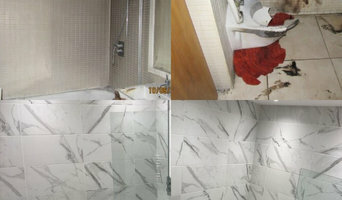 We only sell high quality tiles imported directly from Italy and Spain. BATHROOM, KITCHEN & CONSERVATORY TILING SPECIALISTS SMD Tiling Services specialise in every aspect of internal and external wall and floor tiling and full bathroom refits throughout Glasgow. 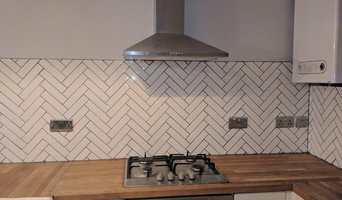 SMD owner Stephen has several years experience within the tiling trade, creating beautiful tiling arrangements with a exceptional eye for detail which other tiling companies don't possess. This is a really important aspect when tiling any wall or floor as most tiles these days either have a pattern or are slightly embossed and are duplicated within each pack, so it's essential that the tiling pattern flows naturally throughout your bathroom, kitchen, hallway or conservatory. So often tilers place tiles on walls or floors in a regular pattern which can be unbalanced and isn't pleasing on the eye. 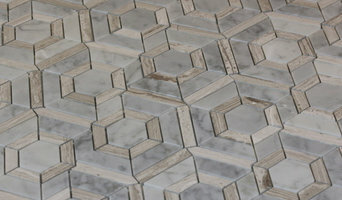 It takes years of trade experience to gain this knowledge and that's what SMD Tiling Services have. We offer the most comprehensive service of any company operating in the highly specialised field of stonemasonry in building. This embraces quarrying, design, production and installation of all types of natural stone: sandstone, limestone, granite, marble and slate. In addition, our laboratory and testing facilities enable us to control all aspects of our own works. Crocatile is a family-owned business in Hillington, Glasgow offering quality bathroom, kitchen, floor and wall tiles as well as wet wall panels and kitchen splash backs. Stocking many exclusive brands and tiles you won’t find anywhere else. We look to continually bring our customers new and exciting products, showcasing the very best in craftmanship. Worktop installers and tilers in Glasgow, Glasgow City can advise on the best tiles and materials to use based on your tastes and requirements and then will be able to install them to a high finish in your home. Kitchen worktops are a major part of your kitchen – you need surfaces that will be scratch and heat resistant, but at the same time still look attractive and work in harmony with your kitchen units, splashback and other kitchen elements. A worktop manufacturer and installer will be able to fit new kitchen worktops or replace old ones with ease, helping you to pick out the best kitchen worktops for your home first. Tiles are so versatile that they can be used in kitchen splashbacks, floors, bathroom walls and as decorative designs elsewhere in the house. Tile manufacturers and tilers in Glasgow, Glasgow City will have a great range of tile designs, sizes and materials to choose from and will help you to pick the best tile for the job. Laying tiles may look easy sometimes, but one badly laid tile can ruin a whole floor or wall, so it’s really best to leave it to a skilled tiler. With Houzz you can find Glasgow, Glasgow City tilers, tile manufacturers and worktop installers near you and check their previous projects, reviews and ratings to decide if they’re a good fit for your home design project. Why should I hire worktop installers or tilers in Glasgow, Glasgow City? Perfectly laid tiles and worktops can look simple and seamless once finished, but installing them is far harder than it looks. It really pays off to hire a Glasgow, Glasgow City tiler or worktops professional as they will have the experience and expertise to finish the job efficiently, quickly and to a high quality. From metro bathroom tiles and porcelain tiling, to kitchen worktops, splashbacks and travertine floor tiles, there will be a tiler or worktop professional who can install the surface you need for your bathroom or kitchen design. There will even be tile and worktop repairers to help you if you need a quick fix-up to your surfaces. Tile manufacturers, worktop professionals, and often tilers in Glasgow, Glasgow City themselves, will also be able to advise you on the right materials to use if you’re not decided on one particular type. They can tell you the advantages of the different flooring, wall tiles and kitchen worktops so you can make the right decision for your home. If you’re after a bespoke tile pattern, mosaic or mural created and laid in your house, this will also be possible with Houzz as we list such a wide range of tile manufacturers, worktop professionals and tilers in Glasgow, Glasgow City. It could be the case that you can find a design or construction company that can offer tiling and worktops as part of their work, whilst also undertaking other projects for your house redesign, so it’s worth looking out for these professionals, too. Here are some related professionals and vendors to complement the work of tiles, stone & worktops: Interior Designers, Architects & Building Designers, Main Contractors, Kitchen & Bathroom Designers, Design & Build. Find a tiler or worktops professional on Houzz. 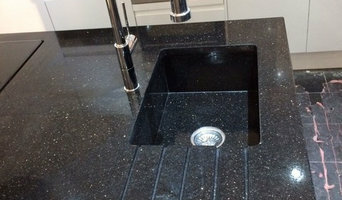 Narrow your search in the Professionals section of the website to Glasgow, Glasgow City tilers and worktop installers. You can also look through Glasgow, Glasgow City photos to find projects you like, then contact the contractors or tilers in Glasgow, Glasgow City who worked on the tiling work or kitchen worktops.